There are a lot of terms thrown around in the photography world. It can be easy to get overwhelmed when looking for the right photographer to capture your newborn baby. When you are trying to decide on a photographer, the first thing to note is what style of photography are you looking for? Do you want your baby posed in a basket with various props and outfits or do you want something more natural? There is no “correct” answer, just what is right for your family. I am a lifestyle newborn photographer. Being a lifestyle newborn photographer means that I do not use props or unnatural poses for your baby. I believe that a baby is beautiful just as they are. So while I will capture portraits of your baby, I let him lead the way, unfolding in ways most comfortable for him. Often parents will comment on how baby sleeps is just like they did in womb (and they even have ultrasounds to prove it)! During a lifestyle newborn photo session, I capture photos of the entire family, siblings, each parent individually with baby, and baby by herself. The goal is to capture those tiny newborn details, along with the immense love and joy your family has surrounding this newest family member. Newborn sessions take place in the comfort of your own home. When you just had a baby, the last thing you want to do is pack up and go somewhere. Being in your own home means everyone is more comfortable, at ease, and relaxed. It also means we can capture where life with a newborn happens, usually focusing on rooms like mom and dad’s room, the nursery, and/or the living room. Learn more about in-home newborn sessions with Why I Only Shoot Newborn Sessions In Your Home. I guide you into poses with mom and baby’s comfort and safety in mind. In the end, a lifestyle newborn photo session captures your family as you are in your home with gentle posing and guidance. When you see your gallery of images I want them to feel real. I want them to be a true reminder of this time right after welcoming a baby into your lives. Your photographs will represent those things that you will want to remember like the way your baby snuggled up in your arms, fit on your husband’s chest, and unfolded when laid down on your bed. 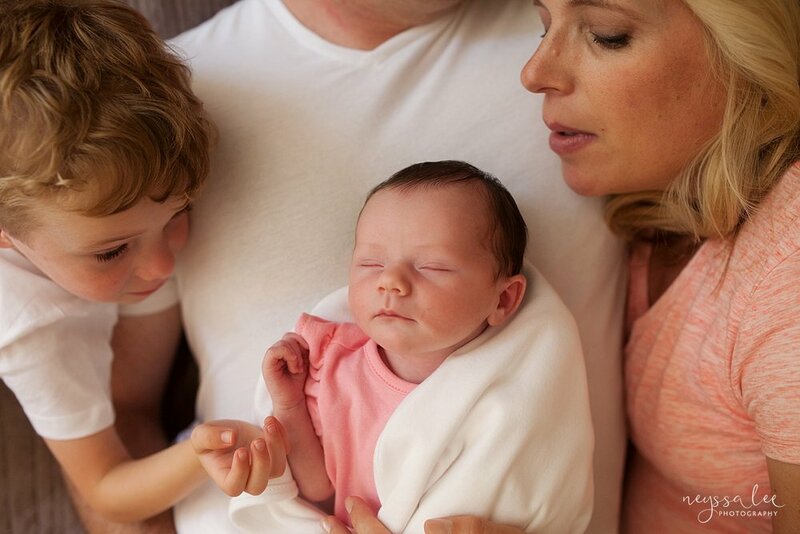 I want you to be able to show off the way your kids loved on their baby sister when you first brought her home. I want you to see your gallery of images and be taken back to those first weeks with a newborn baby in your home. Because we all know, our babies grow much too quickly. If you’re anything like me, as soon as you saw two pink lines on that pregnancy test your brain went into overdrive planning and dreaming about life with your newborn baby. Baby names, nursery colors, and what to put on your registry list are top of mind during those first months of pregnancy. I remember having so many questions about when it was too early to start a registry, or when to even register for the hospital (did you know you are supposed to pre-register at the hospital you plan to deliver at? It is supposed to help the hospital with staffing and planning around your due date). The best time to book your newborn session is during your second trimester to early third trimester. A good rule of thumb is after you have your 20 week ultrasound to get your newborn session on the books. Why? Because when you book ahead of time, I am able to provide you with information to help you prepare for your session. When you hit your nesting phase, you’ll have something to prepare and focus on (instead of scrubbing the tub with a toothbrush!). This also allows plenty of time to do a maternity session or even prepare for a Fresh 48 session as well. Booking early allows you time to prepare your outfits ahead of time. Once baby arrives, the last thing you will want to do is worry about what everyone (including baby) will wear. Knowing you will have a newborn session, you can set things aside ahead of time. In addition to providing tips on What to Wear for a Newborn Session, families often send me photos of their outfit ideas for my input. I can help mom decide on clothing that is not only comfortable for her but that keeps the focus on baby, ensuring your newborn photos are timeless. You book your due date not an actual session date. Babies are unpredictable. They can come early, late, or right on time. 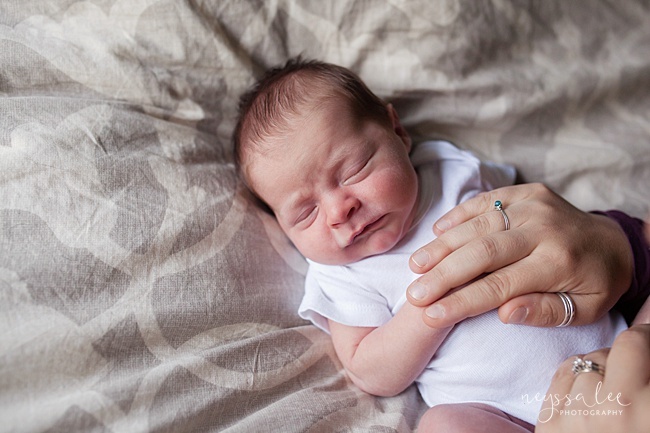 I don’t expect you to know exactly when you will deliver and/or feel ready for newborn photos. Instead, we put your due date on my calendar to reserve your spot. The last month of your pregnancy, you just keep me in the loop, and as soon as baby is here we can pick a date. Most couples finalize the date in the hospital or once you are home and settled in. If your delivery was smooth and you’re feeling great and ready for photos 3 days after birth, wonderful. 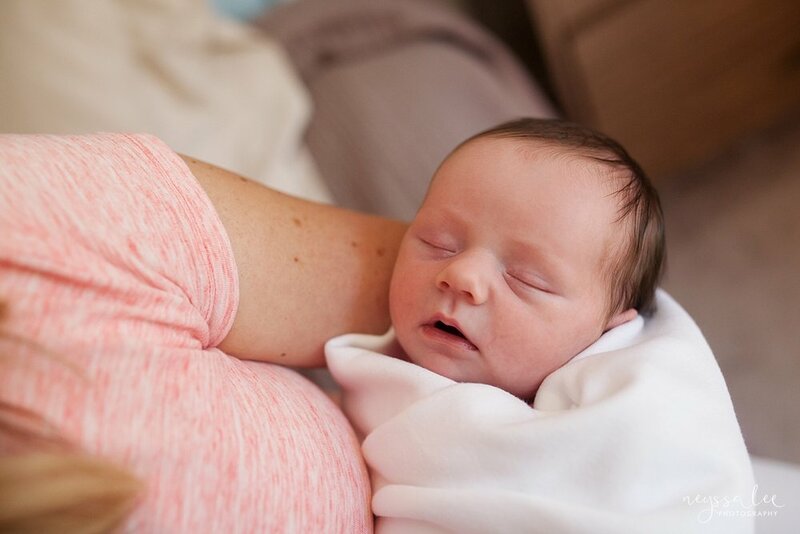 Or if you had a C-Section and need a little more time to heal, we can schedule closer to two weeks after delivery. There is no “perfect” time to book your newborn session. I want to finish by saying there is no right or wrong time to book your session. I have had couples book me at 3 months along, some book during those final days waiting for baby to arrive, and others have booked as soon as baby is here in their arms. I simply am providing a guideline of what couples have found most helpful and relaxing when booking their newborn session. If you have suffered from pregnancy loss, I understand how hard it is to truly believe everything will turn out okay and thus make real plans. So if you need to wait, that is okay. Are you expecting and ready to book your newborn session? I’d love to chat with you about your little one and get your due date on my calendar! You may also learn more about Newborn Photo Sessions and see my Newborn Portfolio to make sure I am the right photographer for your family. And because I can’t help but share a few more favorites from this newborn session, I have included them below! You know those people who just exude love? Like you meet them and are immediately just drawn to their love. These are those kind of people. They not only love their kids and each other, but they love the world. This mama was supporting her husband (which meant going on runs pushing her preschooler in a stroller) as he trained for a half marathon right up until the day she went into labor. Then just weeks after he was born, she was right there at the finish line. Oh and did I mention that this half marathon was to raise money for Team World Vision - bringing clean water to people across the globe. Yup, I told you, you love them already. By the time I had shown up at their house for their newborn session, I had already met their newest addition in the hospital (peak at their Fresh 48 here). Even though it had been a couple of weeks, big brother was still ready to snuggle up with his baby brother, and even sing him a few songs. I could have spent the entire day just chatting with mom and dad while photographing their beautiful boys. 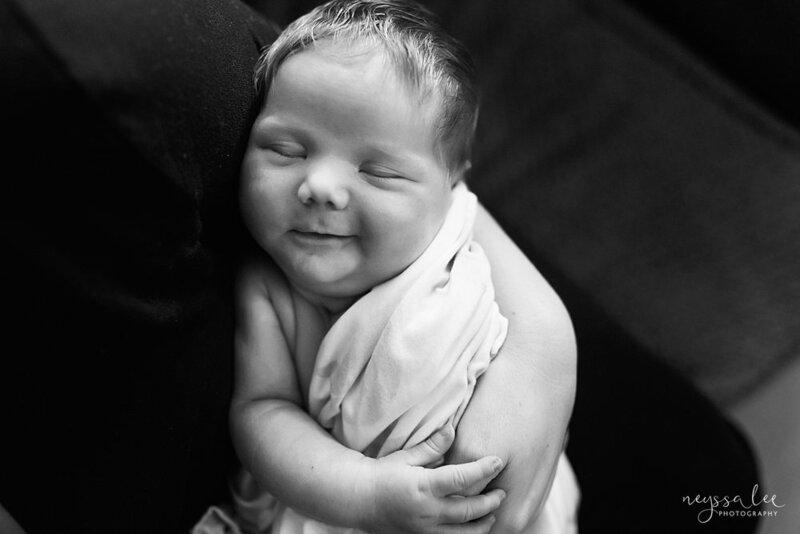 It was a relaxed lifestyle newborn photo session full of snuggles and love. I apologize for the major image overshare (okay, I’m not really sorry!). I didn't know beforehand, but this mama was a little nervous about having Fresh 48 photos taken. I wish I would have known so that I could assured her how relaxed, low pressure, and easy these sessions are. Two weeks before her due date, I received a text that her water broke and they were heading to the hospital. My favorite kind of text as I knew within the next few days I would be photographing her family together for the first time as a family of four. I won't go on too much about how beautiful this baby boy is, how sweet big brother was, how family surrounded them so lovingly, or how grateful I was to be invited just hours after birth to capture brothers meeting for the first time. I will, however, share what this mama emailed me after receiving her gallery. Her words brought tears to my eyes. She not only loved the gallery of photographs I put together for them, but she was so glad she had them done. 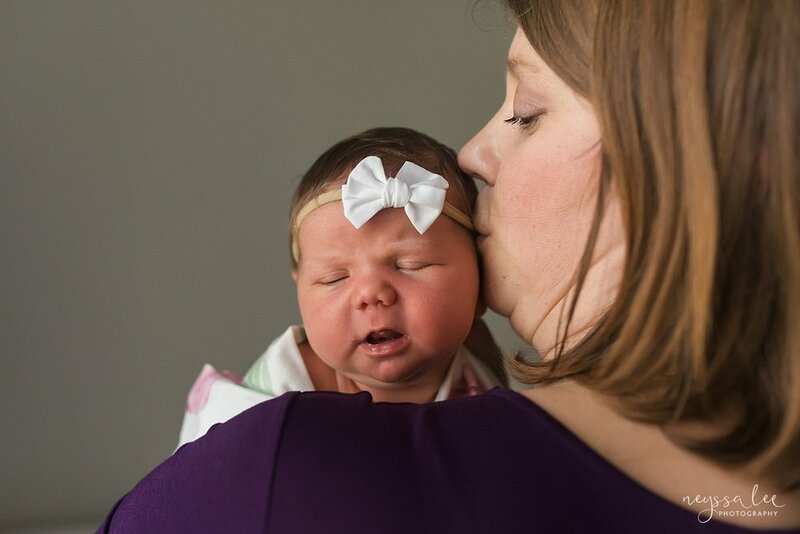 Did these images and this mama's words help you decide to have photos taken during your babies first hours? Contact me to book your session.